DS Arms - DSA AR15 Titanium Low Profile Gas Block - Natural Finish - .750"
Titanium Parts → DSA AR15 Titanium Low Profile Gas Block - Natural Finish - .750"
DSA AR15 Titanium Low Profile Gas Block - Natural Finish - .750"
The DSArms HGT line of parts are made from the best Titanium available. Fabricated from Grade 5 Titanium (Ti-6Al-4V) which is significantly stronger than commercially pure titanium while having the same stiffness and thermal properties, this grade is an excellent combination of strength, corrosion resistance, weld and fabricability. 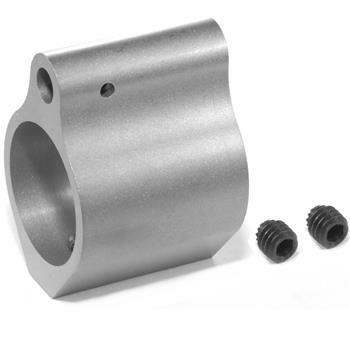 With the DSArms HGT line you get the normal great benefits of Titanium but you also get a high quality part made from the right grade of Titanium required for that particular part. DSA AR15 Carbine Length Gas Tube 9 3/4" O.A.L. DSA AR15 Mid-length Gas Tube. 11 3/4" O.A.L. DSA AR15 Rifle Length Gas Tube. 15 3/4" O.A.L.